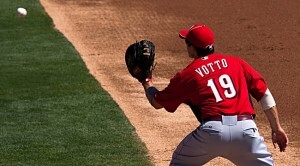 Nate Miller of Rotowire (Pittsburgh) purchased Joey Votto for $27. Can he bounce back enough in 2015 to earn that price tag? This league was run via the CBS Sports league manager up through 2014, so most of the league history is not publicly viewable. It’s truly the granddaddy of them all, having been established in 2002! It’s a ten-team NL-only league where the draft is an auction format, and it’s a rare industry keeper league. The keeper rules make it special. We can share the whole offseason schedule at some point, but suffice it to say, it’s a really great set of keeper rules that makes it my absolute favorite Fantasy sports league of all time! The scoring system is awesome. It’s head-to-head points, with all the typical Roto stats covered but also a hitting slant towards total bases, runs produced, and batting eye (BB:K) and a pitching slant that includes holds, giving middle relievers added value. The top four teams make the playoffs (two week Semi-Finals, two week Finals). We run FAAB at 11 am on Saturdays so you can see the results to prepare for your own Sunday night FAAB (and also 11 am on Mondays in case of any Saturday or Sunday injuries). And here below you’ll see team rosters with the players ordered by position. Any prices that are high are due to inflation on draft day. This is because of the keeper bargains. The prices that are really low are because of contracts and keepers from previous years. Also note that Paul Sporer (San Diego) missed the auction, and the ESPN artificial intelligence was horrible in attempting to fill his roster! I took over this team two years ago, and it is still generally in the rebuilding stage. The intro to this article does glance over the structure of the league; it spans keepers, restricted free agents, contracts, and max salary cap, among a bunch of other fantastic options that makes this one of my favorite leagues that I have ever been a part of. I would love to copy this format for the AL since I prefer it heavily to the NL, but the time and effort is mind boggling to me and I do have to bug Dave from time to time on the exact rules. I run the Hott Schotts, Rizzo, Morneau, Young Jr, Liriano, Kimbrel, and Wood were all great price contracts I carried over for this season, and unfortunately Wood is the only player I still have after this year under team control. After the keepers were selected, each team had an opportunity to grab a non rostered player at their price of last year, I chose Rondon at $2. DeGrom and Rendon (pre injury) were added in another pre main auction. Confused yet? San Diego missed the draft and ESPN’s software did not do him any favors, it will be a long year on the west coast. I think my team is headed in the right direction and hope to be in contention all year. dit :Coucou, alors en ce moment j’ai envie d’un beau plaid bi-matiÃ¨re (polaire et fausse fourrure) avec des tons clairs, plutÃ´t blanc et gris ^^Il serait parfait pour les longues soirÃ©es d’hiver!Merci beaucoup pour ce concours et bonne fin d’annÃ©e! >This was a wonderful post. Yes, I have found that hard times bring character to the surface. Even though I would not have volunteered for any of those hard times, I can see God's hand in them as I look back. My favourite devotional is Streams in the Desert, and the entire theme is God and suffering. Keep up the good work, I enjoy it so much.